Fresh laundry is one of the most relaxing scents in your home, but if each load takes hours and your clothes still don't look clean, perhaps you disagree. Avoid the cost of a new washer and dryer by using one of our top-of-the-line washer and dryer rental options below. You simply pay a monthly rental fee and we will install your new washer and dryer at no charge. Plus, all repairs are included in our washer and dryer rentals – just give us a call if something goes wrong. Each of the options below features large capacities and helpful cycle selections. Even in the midst of continually refilling hampers, you can enjoy the fact that your new washer and dryer will save you money and protect your fabrics. 3.4 cubic foot washer cleans 24 extra large t-shirts in one load. Auto dry senses moisture, stopping the dryer when load is dry. Reversible dryer door can be installed so it opens closest to the washer. Air only option is easy on delicate fabrics. Lint filter on top of the dryer for easy cleaning. 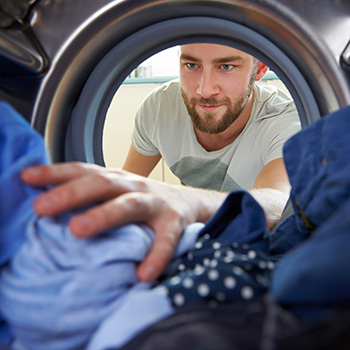 Auto moisture sensing tells dryer when clothes are dry to avoid under and over drying.